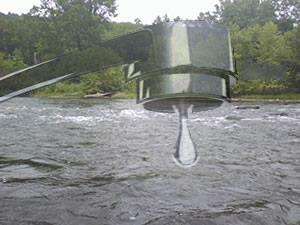 Richmond Water Wars: How to Raise Water Rates, Scuttle Protests and (almost) Get Away With It. Richmond has a water problem. Despite being the ‘river’ city, with some of the finest urban white water in the country rolling through our metropolis, cheap water for its residents is hard to come by. It’s not a question of scarcity: we have plenty of water for drinking, bathing and most household needs. During the dry, drought-prone summer months, conservation is called for, but unlike many Western communities our essential water supply, the James River, is doing okay. The way our system works, water from the James River goes to the Water Treatment Plant where it is settled, filtered, aerated and disinfected to improve the taste and kill bacteria. Then it leaves the treatment plant through a distribution system of pipes that carries the water to Richmond homes. This entire process, with the Richmond Water Treatment plant serving at its center, was put in place 89 years ago. And over those 89 years, the price for water remained relatively consistent, rising with the general rise of inflation, but certainly no faster. But following a national trend, rates were increased significantly in 1999, and continued rising up through 2011, when city council set Richmond’s minimum water charge to $49.40, one of the highest in the country. They needed to raise revenue to repair aging infrastructure, the city council claimed, and so adjusted their books by raising the price of water. Worse, they didn’t tie the price to the actual consumption of water. That $49.40 is where a water utility bill begins, before you take your first sip. This makes for a deeply regressive charge. An average Richmond utility bill can hover around $80 to $100 dollars (or much more). You could live in Richmond, not drink a drop of water, never take a shower and not flush your toilet for a month and still be charged $50 bucks. That rolls up to nearly $600 per household per year before you take your first sip. Scott Burger, director of Falls of the James Sierra Club and a member of the Better Government for Richmond watchdog group, was outraged when he heard of the rate hike last year. “It was despicable,” he said. The rates were especially hard-hitting for the elderly and those on fixed incomes. Further, he didn’t believe the argument presented by the Mayor and city council that the hike was necessary to pay for the infrastructure. He argued instead that the city used water and gas utilities as a “cash cow” whose profit was skimmed into the general fund rather than being used to renovate aging infrastructure or passing the savings on to customers. According to city records, gas and water utilities together contributed about $22 million to the city’s general fund in the form of a “payment in lieu of taxes,” or PILOT, which represents what those utilities would pay in taxes if they were not city-owned. Among other things, the problem is that the ‘general fund’ money can easily be diverted into questionable projects, like the recent deal to bring the Redskins training camp to town. He posted the online petition, featuring a huge faucet, and started signing people up. By September of 2012, he had over a thousand signatures and folks willing to carry signs and address city council on the matter. “What most people are not aware is, if you don’t pay your water bill, it can put you out of your house,” said L. Shirley Harvey, who was protesting at Richmond City Hall. There was some truth to his statement. It’s certainly true that repairing aging infrastructure is costly. The American Water Works Association (AWWA) estimated in a recent report that aging water infrastructure across the United States could cost U.S. municipalities as much as one trillion dollars to upgrade, repair or replace. The question remains, does the money charged to Richmond citizens actually go toward a long-term upgrade solution for that infrastructure, or is ‘profit’ from the utility charges simply skimmed into a ‘general fund’ that can be used for many different needs—heedless of long-term repairs that will be necessary? One other thing to keep in mind when comparing these numbers is population growth. Richmond has relatively static growth, so there’s limited income generated from new hookup fees—which Mayor Dwight Jones contends is some of the lowest in the country. Well, that might be true, but it’s beside the point. It’s low because there’s no money to be made in onetime hookup fees for a city population that’s in a steady state. But that’s where the outlying counties—growing at a remarkable clip– can make up their revenue and it’s one reason county utilities generally charge very large hookup fees — $13,000 or more in Hanover, for example — in turn this enables them to keep their base rate and volume metric rates for water usage relatively low. Finally, even if you could find a few other cities in the country with a minimum service charge as high as $50 dollars, as Major Dwight Jones contends, Richmond’s $49.40 in monthly base charges for water and wastewater are definitely the highest in the immediate area. Hanover County charges $14.17 before usage charges, compared with $17.10 in Henrico and $22.16 in Chesterfield (see the table at the end of the article for a list of comparably sized cities and their corresponding utility rates). In most instances, Richmond more than doubles them. And here’s the interesting part—Richmond is selling surrounding counties its own water from the James presumably at a lower rate than it sells the water to its own citizens. So you have to ask, if water can be sold more cheaply to outlying counties, why isn’t the price lowered for the local community? Furthermore, if a profit is being made off of these utility costs, shouldn’t that be used as a nest egg specifically earmarked for water infrastructure overhauls in the future? Rather than being skimmed off to the general fund? From the perspective of a city council person, it must have looked bad. You’re selling the city water to local counties at a cheaper rate than you’re selling it to your own citizens; an online petition has been signed by over a thousand residents linking your water rates to torture; and a few news pieces note that you’ve got some of the highest water rates in the country. It’s likely, if you’re a wise council member, or maybe just a council member with an eye toward the future, you’ll try to quell that fury. But in order to do that, you will need to make a decision. Do you actually lower rates or do you move the rates around a little. Reduce the one rate everyone is looking at … and then jack up all the rest? Good question. The problem, as Scott Burger has pointed out, was that it wasn’t much of a reduction. Not really. When you add up the volume metric rate, the wastewater rate, the gas increase and the service rate, even with the 50% reduction, on average it still comes up as higher than your last year’s bill. To be precise, it comes to a net increase of 13.8%. Dollar for dollar, one activist compared his costs under the old rate schedule and calculated his bill under the new rate schedule: it came out to twelve dollars more. So last Monday, Scott Burger returned to City Hall. He brought out his signs again, and again he and a half-dozen other community activists stood outside the city council meeting denouncing the new proposed rates with cash cows and water faucets. Beneath their talk of excessive charges, there was a sense of betrayal. And, he noted, the profit from those extra charges will still go straight into the general fund. The Richmond Times Dispatch reported that the city’s utilities are expected to contribute $23.8 million to the general fund next year, up from more than $22.1 million this year. City Council President Charles R. Samuels, a dapper young man who looks to be in his late thirties told a reporter for the Richmond Times Dispatch that he hoped “people are excited to know that their voices are heard” on the water fees. Apparently, there was no irony intended. When asked about specifics in the budget, he said, “We’re all absorbing the budget and getting ready for our meetings,” sounding a little like a man who wished the whole thing would just go away. But neither Scott Burger nor Rhonda Hening nor the other activists look like they’re going anywhere. Ideally, they would like to see a further reduction in the base rate, down to 19 dollars or less, and a more nuanced volume rate schedule, with those consuming the most water (larger households or industries, for example) receiving a higher charge per gallon, while those whose consumption is light receive a discounted fee for conservation purposes. Also, they want to ensure sufficient funds are set aside for long-term infrastructure repair. Last Monday evening, outside the city council meeting, they waved their signs at passing traffic and occasionally a horn sounded. Reporters from local television stations and newspapers stopped by to ask what was going on. The activists were more than happy to explain. The city council is scheduled to vote on the revised budget Monday, May 13, so stay tuned. In the mean time, express yourself! Here’s a handy list of email links and phone numbers for your Richmond city council members. “At present, we pay monthly service fees of $19.68 for drinking water (wastewater has a separate service charge of $29.72—leading to the total water service charge of $49.40) and a volume charge per Ccf of $1.63. If this paper passes, we will begin paying a monthly service fee of $11.56 and a volume charge of $3.21 per Ccf starting in July of this year. While we are pleased with the lower base fee, the difference will be more than made up for with the dramatic increase in the volume charges. Applying the new rates to existing bills, we found a net increase of 13.8%. Paper 53-2013 raises gas fees 3%. Current charges include a monthly service fee of $11.05 and a volume charge per Ccf of .47. If passed, the rates will jump to a monthly service fee of $11.36 and a volume charge per Ccf of .483. Paper 57-2013 raises the fees for recycling. Current recycling charges are $1.69. The proposed recycling charge to begin in July is $1.94. This seems like a fairly small amount, but in fact it is an increase of 14.8%.